While the Network Monitor live statistics module allows you to get a very good picture of the activity that is going on for any given network segment monitored while it is happening (see live statistics) for trending indications you can use ReportBuilder to generate reports on the traffic statistics collected. See picture above. If the network segment you monitor is busy you may want to run separate daily captures to have your daily statistics in individual databases. Running daily detailed reports will be able to give you the network usage trending you are looking for. 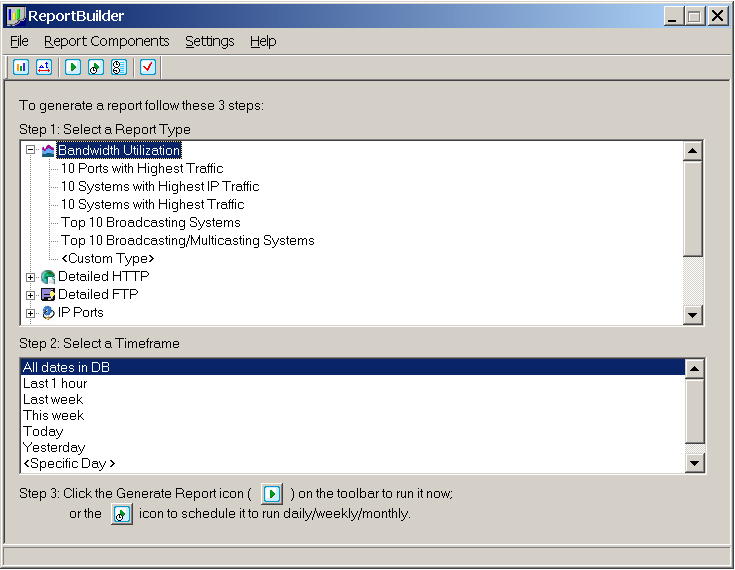 ReportBuilder builds reports based on the statistics gathered through a Network Monitor capture and saved to a Microsoft Access database. ReportBuilder comes with several report templates that are pre-configured and ready to run on your database. It also offers the ability to customize report templates to get quick access to specific information you may need from the statistics gathered. 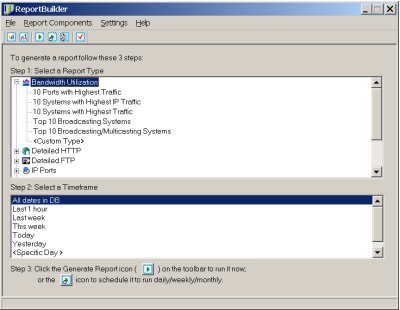 The picture above displays some of the report categories that are available and the prepared report templates in the Bandwidth Utilization category. The maximum size of a statistics file is governed by the maximum size of an Access database file, which is 2GB.